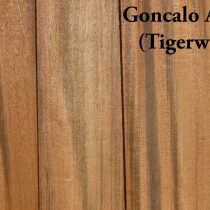 Also known as Tigerwood and Zebra wood (not to be confused with African Zebra wood) Goncalo Alves is found in Central America. The heartwood has ribbons of light golden brown to reddish brown with highlights of black and brown streaks. It is used for jewelry boxes, wood turning and other ornamental articles.